Tamia Garcia is an 18 year old artist born in Trinidad & Tobago and raised there for 12 years. She was raised by her great grandmother and moved to America in 2010. Garcia has been singing since the age of five. She lived in Delaware for about seven years and moved to Philadelphia in March 2016. Garcia brought her best friend Tiyanna Scott to Philadelphia with her in June of the same year. They were both walking to the store one day and saw an open mic event taking place at Ile Ife Park and decided to check it out. They both performed that night and met Kwasi — the visiting artist in residence at the Village of arts and Humanities. 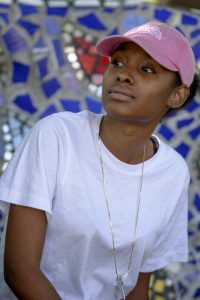 Garcia kept in contact with Kwasi after learning about his project and later joined the “Supa Future Studio” collective. Now, Garcia and Scott manage the open mic events and also perform at them.